Have you heard of the clothing website eShakti? If you haven’t you should check it out right now. When eShakti first contacted me to work with them, I was intrigued and decided to dig around on the website to learn more about them. I was thrilled and immediately ready to work with them once I saw that they offer their clothing in ready to wear sizes as well as offering a customized option. But I’m getting ahead of myself. First go check out the website and take in all of the beautiful, feminine pieces they offer: dresses, skirts, tops, jackets, cardigans, even bridesmaid dresses! Just looking through the website, I was drooling over everything they offered. I love to get dressed up and feel extremely feminine and put together, and eShakti’s clothing line offers just that! As I said above, they offer a customized option for their clothing. This comes in very handy for a certain pregnant lady who has no clue what size she is anymore, not to mention what size she’ll be in a few weeks! All I had to do was send in my measurements (they have a super easy online form to fill out) and in a few weeks I received a dress that was made just for me! The label even says custom! I feel so special having a dress made with my exact measurements. And the dress – I love it! 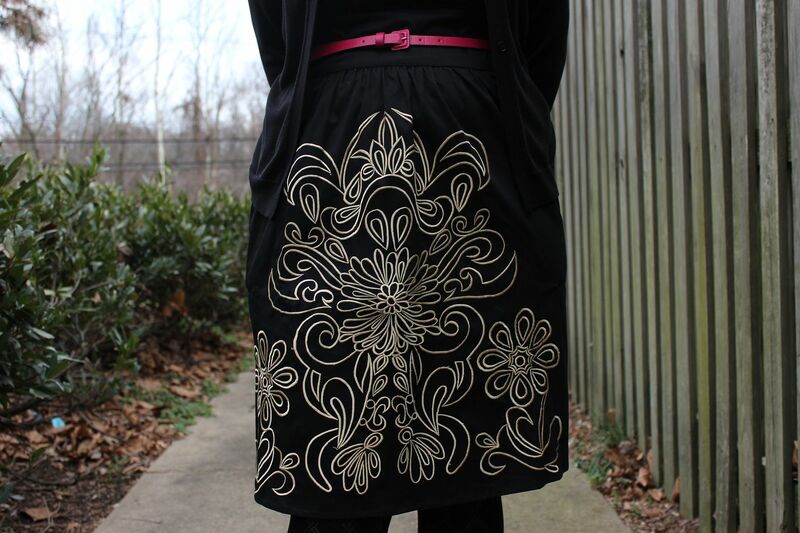 The embellishment on the skirt is simply gorgeous. And I love that I can take the dress from winter (by wearing tights and a cardigan) into spring. The fabric is just the right material to be a dual season wardrobe piece. To order the same dress I selected, click here. I definitely recommend eShakti as a new place to check out pretty clothes. If you like beautiful dresses and skirts, I guarantee there is something for you on the site. With tons of items to choose from, you might end up liking more than just one thing. And I certainly recommend the customized option, that way you KNOW the item will fit because it was made just for you. And they don’t charge an arm and a leg or your first born child to customize the clothing. Score! And if you go to the website right now, they are offering a $25 gift certificate for new members. So you’d be crazy not to check them out! Dress: c/o eShakti. Cardigan and Tights: New York and Company. Shoes: DSW. Earrings and Belt: Target. I’m linking up with Style Elixir for Style Sessions and The Pleated Poppy for What I Wore Wednesday. Absolutely Gorgeous Lindsay!!! You look great it in too! I love the bright pink belt for a pop of color! This dress is so pretty on you! Love the pink belt too :) great for valentines day... obviously you don't love pink at all..
Gorgeous outfit, the detail on the dress is amazing! I'm a new follower by the way, you have a great blog! aw i love that dress on you! i have one from them too.. but i got it customized short.. a little too short haha. i guess that's bc it's kind of a work dress so i still wear it out! Gorgeous dress. I fear that I'll screw up my measurements, but I've been looking at their site and I think I might have to go for it.